An old-fashioned dessert with a new twist! 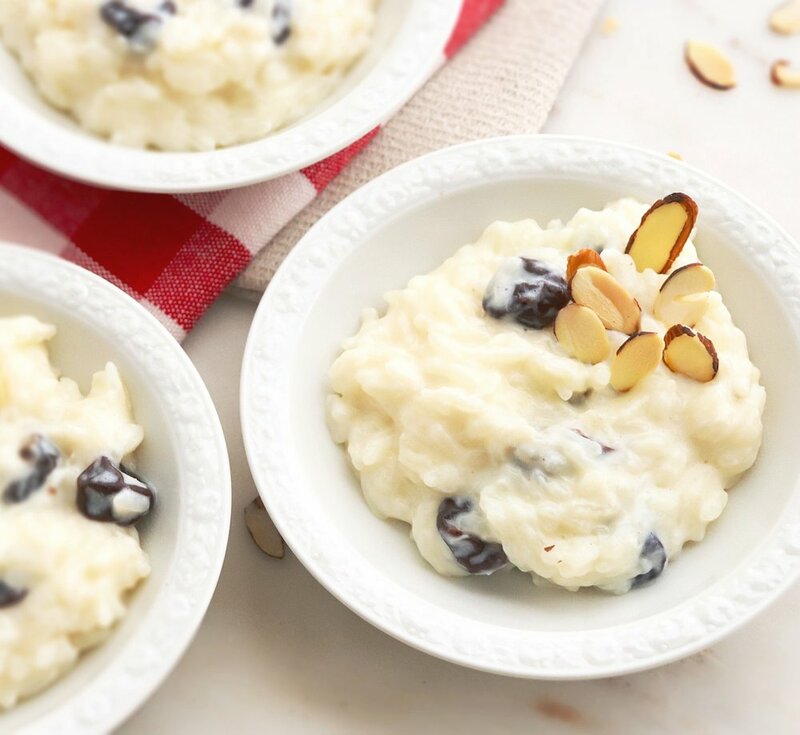 Creamy rice pudding, chewy dried cherries and just a hint of almond combine to make a comforting treat. Rice pudding seems to be one of those foods people either love or hate. Personally, I love it! I remember my grandfather taking cold, leftover rice, sprinkling it with sugar and adding a splash of milk for a snack. (He also did that with saltine crackers which sounds odd I know but is actually very tasty!). I used Jasmine rice in this recipe because I love the smell of Jasmine or Basmati rice. If you don’t have either of those you can use regular long-grain white rice. Many people like raisins in rice pudding but I’m not a raisin fat! Dried cherries, though - love them! A touch of almond extract adds another delicious flavor and you can even sprinkle some sliced, toasted almonds on top for a little crunch. Adding an egg to the mixture as it is finishing cooking helps to make the rice pudding extremely creamy, thick and rich tasting. Be sure to add a little of the hot rice/milk mixture to the beaten egg instead of simply stirring the egg to the mixture- this will help avoid scrambled egg in your rice pudding! Cherry Almond Rice Pudding - Comfort in a bowl!! In a large saucepan, bring water and ¼ tsp salt to a boil. Add rice and bring back to a boil. Reduce heat to a simmer and cover with a tight fitting lid. Cook for about 15 minutes or until water has absorbed. Increase heat to medium, add milk and sugar and cook until thick and creamy, about 25 minutes, stirring occasionally. In a separate small bowl, whisk the egg. Add ¼ cup of the hot liquid mixture to the egg and whisk to combine. Slowly whisk the egg mixture into the milk and rice mixture. Cook for an additional 5 minutes. Remove from heat and stir in butter, vanilla and almond extract and cherries. Serve warm or chilled. Garnish with sliced almonds if desired.